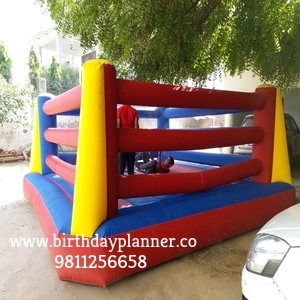 Inflatable Boxing Ring On Rent in Delhi for events. 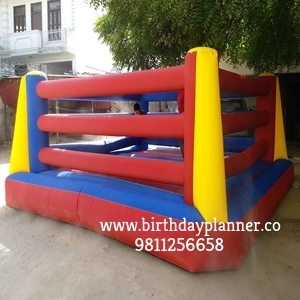 Good quality gladiator jousting inflatable bouncy on rent in Delhi. This jousting ring measures sixteen feet by sixteen feet, and the pillars in the middle are four feet high. You will have nice padded walls and a soft padded base to fall down on if you are the unlucky one who got knocked off of the pedestal. Never fear though as it is easy to get back and go again because there are padded helmets for safety and each sparring bar has a soft foam construction. Beside the fact that this is an inflatable stage means everything will have a cushioned landing. Inflatable boxing ring is a outdoor activity. 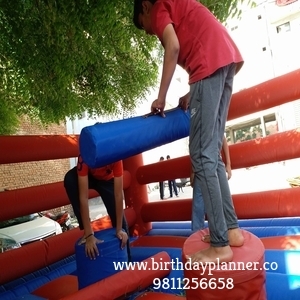 It is most popular activity at birthday party and corporate event too. Inflatable boxing ring is for adult party activity. Inflatable boxing ring is very popular among the adult party. Bouncy with Boxing Ring is a fully inflatable for adult party. Inflatable Bouncy with ring set up easily on any surface. Boxing Ring for teens and adults. This inflatable boxing ring safe with fun activity. The inflatable boxing ring is a favorite of children boxers and adult boxers alike. Once you set foot in the boxing ring you will be ready to rock your opponent because inflatable boxing ring with foam boxing gloves are the perfect thing for your office or birthday parties. Inflatable boxing ring is safe and harmless therefore this boxing ring allows people to get involved with the party and have a good time. It would be a great addition to any party. With the pair of over-sized boxing gloves, this sports-themed bounce house is fun to play. Sparing contestants enter the inflatable ring wearing over-sized boxing gloves. When the referee sounds the bell, the contestants start their fight. The first boxer to knock down his opponent within three, one minute rounds is the champ.